PROTECTORS - Rescue Action Drama. Spier Films, London/South Africa. Budget $25m. In the near future, an eccentric New Yorker inherits a game park in Africa. He finds himself drawn into saving one of the last herds of elephants in the world from a violent and determined army. GIOVANNI'S ROOM - James Baldwin-Scott Inc, Los Angeles. THE INCUBATE - Vaughan Films, London. INSIDE OUT - Signfour Films, London. 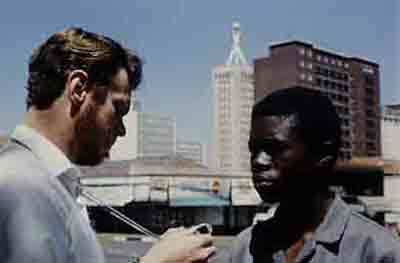 MESSENGER OF THE LOCUSTS - Mukuvisi Films, Zimbabwe. AXA - Lizard Sarl, Paris.